Multipartite ssDNA genome (+) composed of 6 to 8 circular segments about 1kb in size. 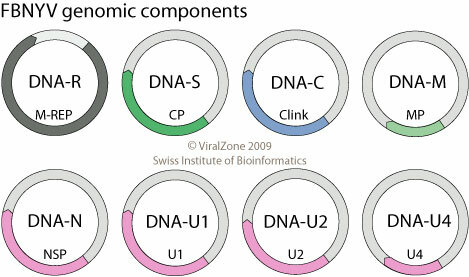 Each ssDNA segment have a common stem-loop region and are encapsidated in a separate particle . In addition to genomic DNA, satellite-like DNA are commonly found, usually encoding for Rep proteins. These satellite-Rep proteins are only able to initiate replication of their genomic DNA, unlike genomic Rep which promotes replication of all 6-8 viral genomic ssDNAs. Each ssDNA genome segment is monocistronic. In rare cases a gene encodes for two overlapping ORFs. ETYMOLOGY Nano: From Greek ‘dwarf’. TRANSMISSION Vector=Aphids. The virus does not replicate in this vector. Nanoviruses Clink protein is probably involved in binding and inhibiting host retinoblastoma protein. Inhibition of retinoblastoma protein induces transition from the G1 to S phase for optimal replication conditions.